To provide a delivery system, for both private and corporate donors, to adopt and sponsor hospital rooms and care units for children. These facilities will have a differentiating superiority because they will provide a “home away from home” atmosphere, for seriously ill children and their families. 10th Annual Aerotek ADOPT A ROOM Golf event - September 22, 2014 @ Dellwood Hills Country Club ! We are having our 10th Annual Golf Event to support the design and construction of world class hospital rooms at the University of Minnesota Children's Hospital. VIDEO: Smith reacts to the Adopt-a-Room. Superstar Will Smith visited the University of Minnesota Children's Hospital, Fairview, December 12. In town for the Twin Cities premiere of his new movie, Seven Pounds, Smith delighted patients at the hospital and parents alike. He handed out gifts, posed for pictures, and signed autographs. After his visit, one parent said, "My son wasn't feeling very well this morning, and it was a struggle to get him to the playroom, but now look at him — he's sitting up at the computer, with a big grin on his face!" We are very thankful for Smith's time and generosity! The University of Minnesota Pediatrics Foundation Explains the benefits of the Adopt A Room program and how it will help children and their families. .
Perkins + Will & Adopt A Room Designs Wins 2008 International Heathcare Design FAB Award. 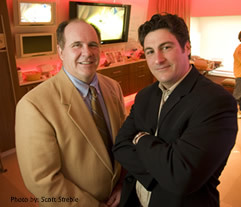 National Heathcare Design Magazine Showcaeses the Adopt A Room Suites to a National Audience. Healthercare Design Magazine is a natioanlly recognized publication for architects, designers in the health care industry. Adopt A Room's grand opening of the first 2 suites at the University of Minnesota Children's Hospital-Fairview. Take a Look - KSTP Channel 5. Your donation will help provide extraordinary environments for seriously ill children and their families. Adopt A Room is a 501(c)(3) Foundation. "The environment in the treatment facility [has] an effect on the positive attitude of the patient "
Oncology Nursing Forum. "Positive Attitude in Cancer: Patient’s Perspectives." May/June 2003, Volume 30, No. 3. Adopt A Room teams up with Paypal to accept online donations. To view and print a donation form, you will need Adobe Acrobat Reader.